This leg is where you will start to feel the remoteness in earnest. It's possible in one day, but it will be a long, hard walk (9+ hours) even for fit and experienced walkers. You leave Glendessarry in the shadow of a trio of giant munros (Sgurr na Ciche, Garbh Chioch Mhor and Sgurr nan Coireachan) on a path that can be hard to follow in places and as you pass the small lochans and descend along the Finiskaig river the landscape becomes increasigly Tolkeinesque and wild. The first sight of Loch Nevis is spectacular, one of Scotland's finest sea lochs, it runs 20km inland from the open sea at the Sound of Sleat. 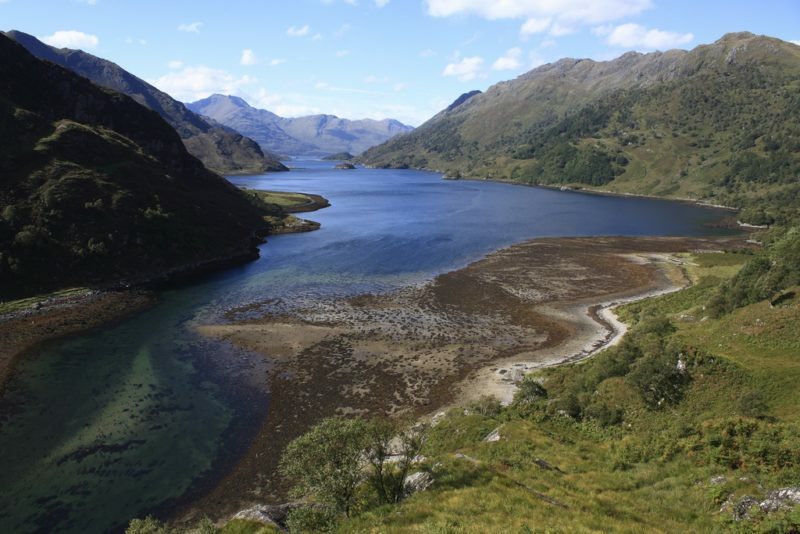 You are now deep in the rough bounds of Knoydart and the village of Inverie on the peninsula is the closest human habitation. Sourlies bothy, nestled at the end of the loch and frequented by a panoply of wading birds and the odd seal is an idyllic spot to stop. 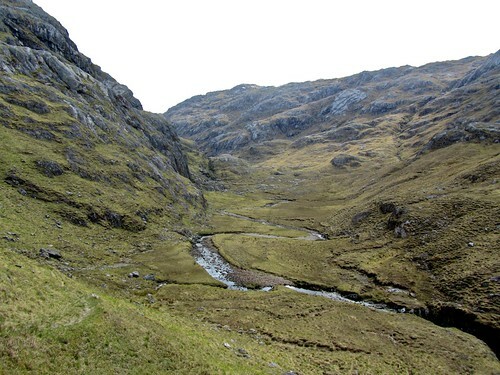 The walk up River Carnach on a clear riverside path affords imposing views of Luinne Bheinn to the north and some excellent wild camping spots before you ascend steeply over rough ground towards the bealach that takes you down to Barisdale and Loch Hourn. Barisdale is a small collection of buildings huddled on the south shore of Loch Hourn enjoying a wide vista that spreads out towards Skye. There are sweeping views of Beinn Sgritheall towering above Arnisdale to the north and the imposing bulk of Ladhar Bheinn to the west. There is a campsite and a bothy owned by the estate for which there is a small charge. The estate also rents out two larger buildings as accommodation (one sleeping 3-5 people, one 8-12). You could head for Inverie by climbing up from Carnoch (a long, steep, drag) and then descending via Gleann Medail. However, this is quite a detour and you're only just getting off the beaten track. If you did go for this route variation, you can rejoin the trail by heading North from Inverie up Gleann an Dubh-Lochain to Barisdale.